Here is a collection of various online tools I use to research security related to specific URLs. Order is not related to usefulness as each has their own usage. WOT (Web of Trust) is one of my favorites but they all have their uses when researching malware sites. Description: VirusTotal is a free service that analyzes suspicious files and URLs and facilitates the quick detection of viruses, worms, trojans, and malware. Use Case(s): Virus Total is a very easy tool to use and can give immediate returns for better known exploits, viruses, malware, etc. This site can also analyze either a single file or full URL. Just because a check comes back clean DOES NOT mean the file or URL are clean. If one or more of the results identify the file as MALWARE beware as there is a high potential for infection. Evaluate a potential malicious file by uploading it. Evaluate a potential malicious URL scanning it. Here is a URL sample report of an infected site. It does not show the full list of all engines that check, however what should be of interest and concern to you is that at least two of the sites registered the URL as MALWARE. Description: URLVoid.com is a free service developed by NoVirusThanks Company Srl that allows users to scan a website address with multiple website reputation engines and domain blacklists to facilitate the detection of possible dangerous websites, used to distribute malware and spyware or related to fraudulent activities. This site can simply be thought of as a website blacklist database. Use Case(s): This site has much the same use case(s) as Virus Total, however there are a few unique features that URLVoid has that Virus Total does not have. Shows Website Blacklist Report with clickable links to each of the blacklist sites. Some will pull up reports like MyWOT, others will take you to the search page where you can search again for the questionable site directly. Test if the site is still up and responding. Shows IP Address Details, server geolocation and “website neighbors”. This site also provides informational traffic graphs. Use Case(s): This site has much the same use case(s) as Virus Total and the base function of URLVoid, however it also has a unique feature of its own – a large self-reporting user community base. The largest value I find from this site is self-reporting comments and user ratings. 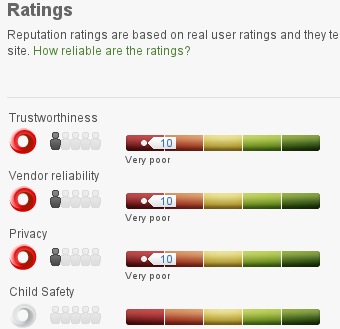 User ratings are broken down by Trustworthiness, Vendor Reliability, Privacy and Child Safety. Evaluate potential malicious URLs broken down by Trustworthiness, Vendor Reliability, Privacy and Child Safety. Additional information regarding blacklisting’s (such as from SURBL) is provided. User comments are provided for some sites. When these exist I find they can be particularly useful, especially when users report sites contain malware and have overall poor ratings. What happened when Google visited the site: This section will list the number of Trojan(s) and Exploit(s) hosted (not type) and can also provide details such as “infection resulted in an average of 1 new process(es) on the target machine”. Has this site hosted malware: This section can contain other domains which are either associated or were infected by this domain. Description: vURL is a webpage dissection service that was developed due to limitations that were found in alternate services of similar function. This is probably one of the most complex online tools and certainly the most complex listed on this page. Most of the other tools available will usually provide you enough information to determine if a site is hosting malicious content, however in some cases it may not be clear or there is a need to see what the output of the code is when visiting the site without risking infection to your own machine. When this is needed it is time to utilize the power of vURL Online. Need to dissect a URL. And this is where the real fun begins. A line by line breakdown of the entire webpage response. This can be useful for identifying re-directions obfuscation, etc. It has a lot of power, way more than is appropriate to provide detailed information within this document.